David Krut Projects is pleased to present our 2015 Editions Showcase, a group exhibition of new prints, etchings and other multimedia artworks created in 2015 that have not yet been on display at our Cape Town gallery. Artists included in the showcase are Aïda Muluneh, Faith47, Lorenzo Nassimbeni, Mischa Fritsch, Mongezi Ncaphayi, Quinten Williams, Rhett Martyn, Robyn Penn, Senzo Shabangu & Stephen Hobbs. Ethiopian artist Aida Muluneh, spent much of her youth between various countries (including Yemen, England, Cyprus, Canada and the US) before returning to Addis Ababa, where she currently lives, and where she founded the Addis Foto Fest. Her photography embodies social, political and existential experiences and it portrays her view of what drives cosmopolitanism in societies with a colonial heritage. Muluneh made her first visit to South Africa in September 2015 when her work was exhibited as a part of the David Krut Projects booth at the Johannesburg Art Fair. Muluneh has also exhibited locally in recent group shows – Ikauru at the University of South Africa in Pretoria and FANTASTIC at the Michaelis Art Gallery, UCT. Mischa Fritsch was born in 1970, in Johannesburg, to Austrian parents, pioneering expats from Vienna. At the age of seven his family relocated to Munich, Germany, where he attended a Waldorf School that was to inspire his future career in jewelry-making. The art of jewelry-making later developed into a talent for projects on a larger scale, and Fritsch began experimenting with found materials and metals in the medium of sculpture. A recent collaboration between Mischa Fritsch and the David Krut Workshop in Johannesburg initiated the development of experimental printmaking, mediated by site-specific intervention and the inclusion of the “element of chance”. Faith47 is both a street and studio-based artist from Cape Town, South Africa. She has an active street art career spanning more than 15 years. Her approach is explorative and substrate appropriate and uses a wide range of media. Faith47 attempts to disarm the strategies of global realpolitik through her art as she engages with a notion of social awareness in most of her works. Using feminine figures as the core of her art, she highlights the condition of women in society. Her work is a visual representation of an internal and spiritual dialogue that speaks of the complexities of the human condition. Senzo Shabangu, born in Driefontein, Mpumalanga, studied printmaking at the Artist Proof Studio in Newtown, Johannesburg. His monotypes depict scenes of the Johannesburg CBD, often placing city landscapes emerging from below or suspended above his characters creating an almost claustrophobic sense of being surrounded by the city environment. Protest action, the media and symbolic depictions of the poor’s struggle are integral to Senzo’s latest collection of work. Within this theme, Shabangu also deals with inner city movement and how people are moved. Rhett Martyn was born in 1971 and currently lives in Johannesburg. He has worked extensively as a lecturer, freelance designer, illustrator and concept artist. Since 1994 Martyn has exhibited across the world with numerous solo and group exhibitions. 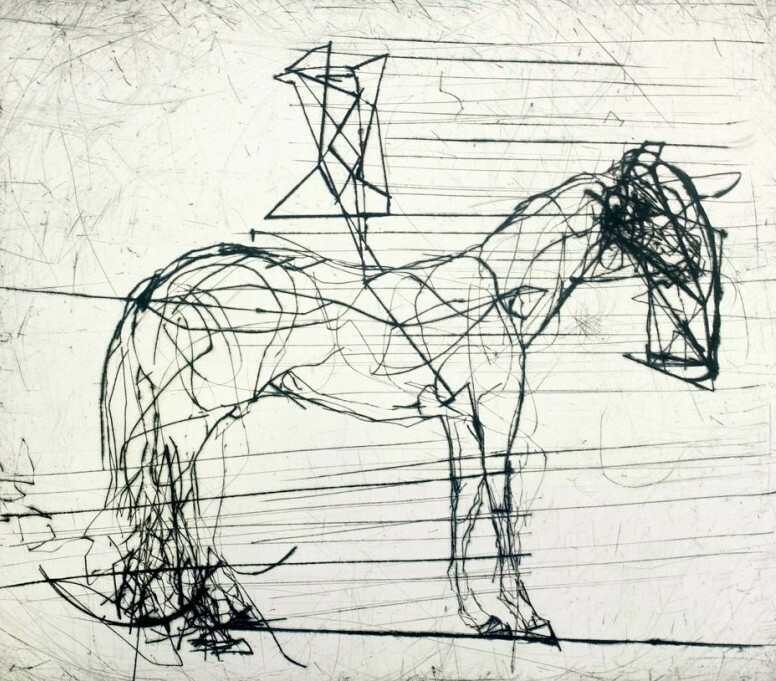 His recent work “Drawing Horses” focuses on the horse in a kind of abstract space, disconnected from its original frame that comes with typical connotations. This therefore allows the audience to have their own personal point of view and with this emerges new symbolic possibilities. The work of architect Lorenzo Nassimbeni is unique in its focus on the area where the disciplines of architecture and fine art meet. The practical methodology which he employs is powerful, describing the essence of his primary inspiration, the ‘urban landscape.’ Across the media of wall-covering, fabric design, mural design and fine art, his portfolio of work is unified by a signature architectural style of drawing: a distillation of black line on white background. The series on display here is inspired by the Cape Town ocean. The most recent addition to this growing body of work is titled, Cloud of Unknowing, which sees both a continuation and development of the themes and formal concerns of her Cloud oeuvre. Mongezi Ncaphayi’s work stands out for its abstract qualities and its intuitive repetition of form and colour. Ncaphayi creates intricate Works and his practice is process-driven. Webs, arrangements of pattern, line and landscape are carefully mapped out, combining paint and printmaking, as if tracing the stories of a constant evolution in his compositions. Ncaphayi explores and investigates South Africa’s socio-political history, with a particular focus on the history of mineworkers and mining politics. Trained at the Artist Proof Studio in Johannesburg, Ncapahyi is interested in the displacement of the migrant worker, the assimilation of cultures, and systems that governed migratory relations. The point of reference of Hobbs’ practice is his interest in the behavioural aspects of the city and society, particularly that which takes place in Johannesburg. His work forms an insight to how urban planning and the general aspects and processes of art in public space turn from an apartheid city to an African one. Hobbs spoke about defensive architecture in relation to his art (videos, installations, photographs and sculptures), in which he uses wartime camouflage painting to depict how urban planning can turn our cities into battlegrounds, as has happened in Johannesburg in connection with the “white flight”. As one of South Africa’s most well-known public artists, Hobbs is constantly alive to processes of urban change. 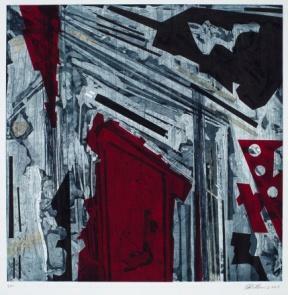 In his printmaking, he tries to incorporate a light, direct style characteristic of his urban art. Quinten Williams lives and works in Johannesburg and experiments with various media, including painting and print. 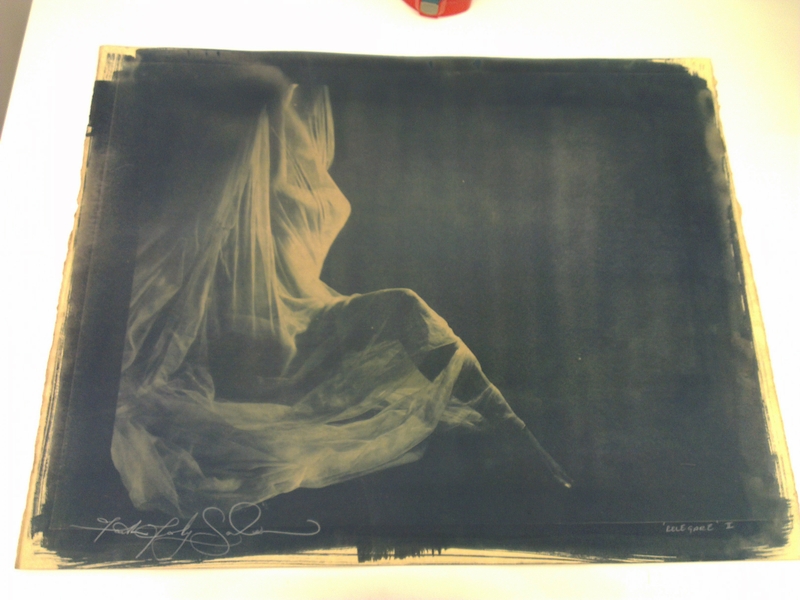 He began his relationship with the David Krut Print Workshop (DKW) in 2012 with the production of a series of monotypes under the guidance of Jillian Ross. This initial encounter opened up opportunities to experiment with other forms of the printmaking processes at DKW in 2013 and 2014, most recently the etching process. Williams is intrigued by the printing process, as he sees some similarities to the way he has been using acrylic paints in terms of “glistering colours, painterly marks, drawing marks and layers, one on top of the other”. For queries about availability, pricing and/or high res images please contact Güte: gute@davidkrut.com.